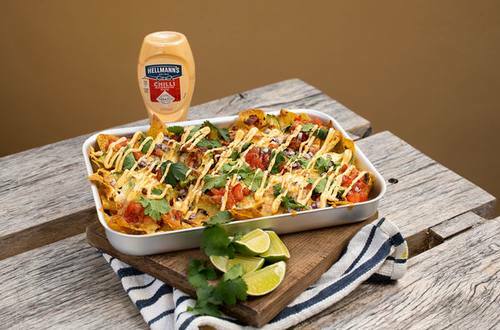 Tender chicken & crunchy tortillas, rich cheddar & fresh coriander, all topped off with Hellmann's Chilli Mayonnaise with Tabasco create these nachos. 1 Place the oil in a frying pan and set to a medium heat. Season the chicken breasts with the fajita spice and place in the pan. Cook on one side for 5 mins then flip the chicken and add passata to the pan. Simmer low for 15 minutes. When the chicken is cooked, take two forks and shred the chicken in the pan. Mix well with the sauce. 2 Place the tortilla chips in a deep baking tray. Top the chips with the chicken & sauce, avocado slices, sour cream and the cheddar and place under a hot grill until golden and crispy. 3 Remove from grill and top with red onion, tomato salsa, coriander leaves and the Hellmann’s X Tabasco Chilli Mayo. Serve with lime wedges on the side.